Made this after I saw this clever notebook on Pinterest. Watercolored the green rind, and, while that was drying, watercolored the red and pink fruit. Mixed some very pale gray paint for the space between the green and red and let some of the paints merge. Hand painted the seeds. Stamped a sentiment from Altenew's Layered Cupcake and drew the lines with a black copic liner pen and ruler. Speaking of fun, I picked two winners because the giveaway box was getting huge. Thanks to all of you who commented. Winners: Merry F. and Cheryl Robertson. I've sent emails to both. Cheryl, I haven't heard back. Please check your spam folder for an email entitled "Winner of Blog Giveaway." MOOD WHEN DONE = This is one of my favorite cards. So I'm happy!!! Stunningly creative and so skillful with the watercolors! Jack would love this card. One of his favorite foods is watermelon. Fantastic card and congrats to the two winners. I just love the summery feel of this great card Joan!! Oh, Joan, this handpainted watermelon card is fabulous! Super fun card, and a perfect sentiment! 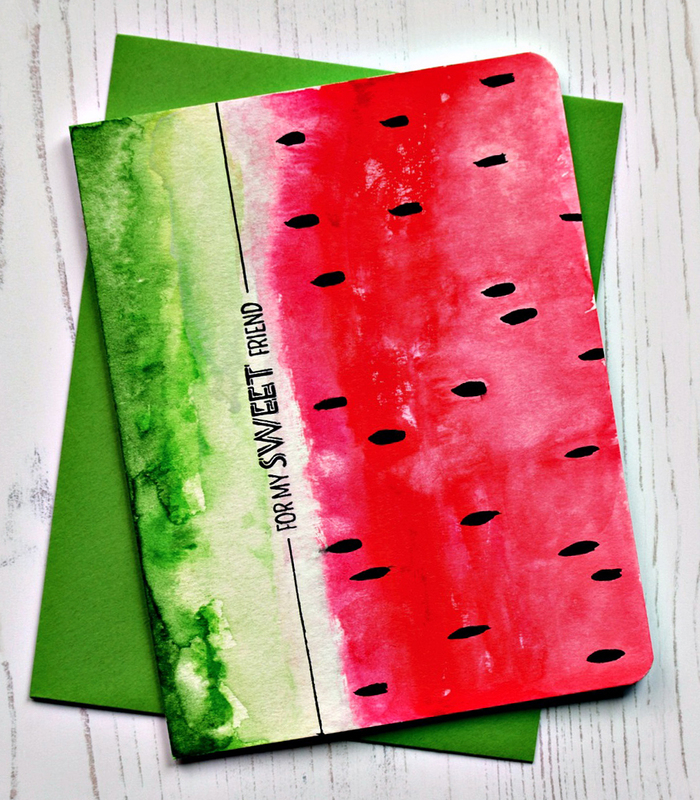 What a fabulous card -- I can taste the sweetness! I'm so excited to win a box! I hope I they'll help me to be creative! Thank you!!! What a great card!! Love it! Oh. My. GOSH!! This is so amazing I could almost pass out! It gives me a little adrenaline rush. Seriously. That green rind! Totally amazing watercolor expertise. I know I should go look at the notebook, too. I pinned your card, but tough decision whether to put it under "cute cards" or "beautiful cards". It's BOTH to me! I am in love with your gorgeous and creative card!! SWOON!! I love this juicy looking card! So cute!